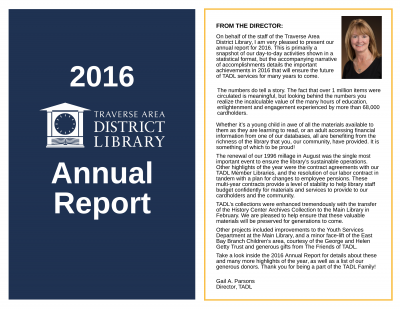 Traverse Area District Library is a taxing authority. It is funded primarily by a 0.9548 Mil property tax authorized by the residents of Grand Traverse County in August 2016, which has been reduced to .94310 mils (December 2018) for compliance with the Headlee Amendment, and the levy expires in 2025. Other revenues come from Penal Fines, State Aid and various fines and fees. Traverse Area District Library responds to FOIA requests in compliance with Michigan Freedom of Information Act, according to Traverse Area District Library FOIA Policy. Depending upon the extent of material requested, a fee may be charged. Residents who wish to place a FOIA request must direct them to the TADL FOIA Coordinator, who is the Library Director and must do so in writing as outlined in the Traverse Area District Library Freedom of Information Act Public Summary. Employee Survey -Results will be used to evaluate many aspects of TADL operations and management, and will be an important tool in upcoming strategic planning. Service Delivery Planning Guide – A recent study commissioned by TADL providing a thorough review of the information on regional library service needs, expectations and opportunities. Additional Planning Resources – A helpful list of library community information resources. Strategic Plan – Recognizing that an active Strategic Plan is a valuable organizational tool and realizing a need to take a new look at the whole TADL system more in depth than regular board meetings allow, the Board initiated a strategic planning process in the fall of 2006. Hartzell-Mika Summary Report – Hartzell-Mika Consulting was engaged by TADL to review staffing and organizational structure at the main (Woodmere) Branch Library and the two other branch libraries (East Bay and Kingsley). Strategic Plan – Progress Report and Conclusion – A report highlighting goals, strategies and outcomes.